Before we look into different nail art designs, we need to discuss the supplies you might need. If you intend to create simple and elegant designs, you don’t need much but if you want to truly delve deep into the world of nail art, you might need some tools. You can make do with just the top coat, base coat, nail colors, and other essentials so you don’t really need acrylic paints, nail stickers, loose glitter, and rhinestones but they’ll help you create designs with a little more oomph. As mentioned before, there’s no limit to what you can do with your nails. You’ll find several articles online that showcase and describe different nail art designs. Some of the more flexible designs can be easily customized to your needs. French Manicure With a Twist – The traditional French manicure is a simple, elegant, and timeline nail art design. It looks great and is easy to do, especially if you have steady hands and have done some practice. However, you can easily spice up the design by adding a creative twist. You can add a chevron design with the traditional French manicure colors, add glitter to the tips of your nails, place an upside down V at the tips of your nails, etc. Some artists also create beautiful designs with the white color like flowers, butterflies, stars, and snowflakes. Polka Dots – Polka dots are very pretty and playful. They’re also surprisingly easy to create, especially if you have a dotting tool. You can use any color combination you want to create different kinds of effects. For example, the traditional black base with white polka dots looks sophisticated and elegant while red polka dots on a white surface will look playful and bright. There’s no limit to the number of combinations you can create. All you need to do is make sure the base color and the polka dot color complement each other. Stripes and Lines – Stripes and lines can also help you create versatile and interesting nail art designs. You can do simple vertical or horizontal stripes, combine the two to create a check pattern, or paint stripes of different thickness the on the nail. If you have nail art stickers or stencils, stripes and lines are very easy to do. If you don’t, you just need to have steady hands and some practice to create straight and sharp stripes. The end result is always attractive and interesting. Matte and Glossy – The combination of matte and glossy polishes can give a mesmerizing effect. For example, if you add glossy black polka dots, flowers, or designs on a matte black surface, the effect is sophisticated and eye-catching. This is one of the easiest ways to create an interesting design. You can also paint some nails completely matte and some completely glossy. Glitter and Holo – If you’re a fan of nail art, you’re probably familiar with the term holo. Holographic top coats add some sparkle and glitter to your nails and don’t require much effort. You can easily apply a good basecoat, add the holo top coat, before you apply a glossy top coat over it to enhance the shine and glitter. 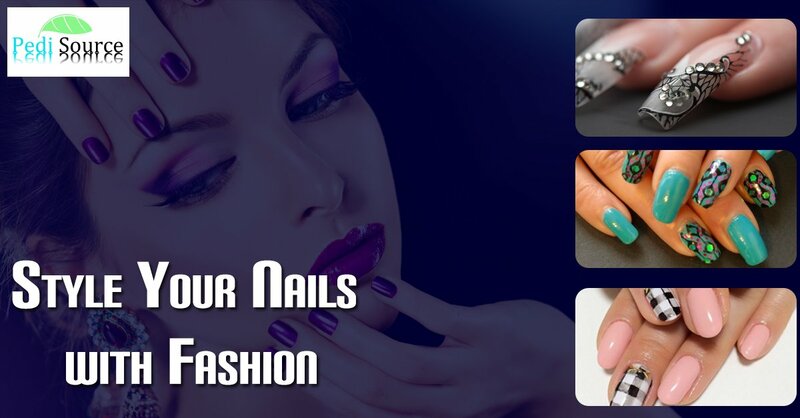 If you have any questions about nail art designs or want to know more about our pedicure products, you’re free to contact us at Pedi Source. Just give us a call at 1855 429 PEDI. You can also email one of these two email address with your questions and contact details: [email protected] and [email protected].